What a Difference a Stitch Makes! 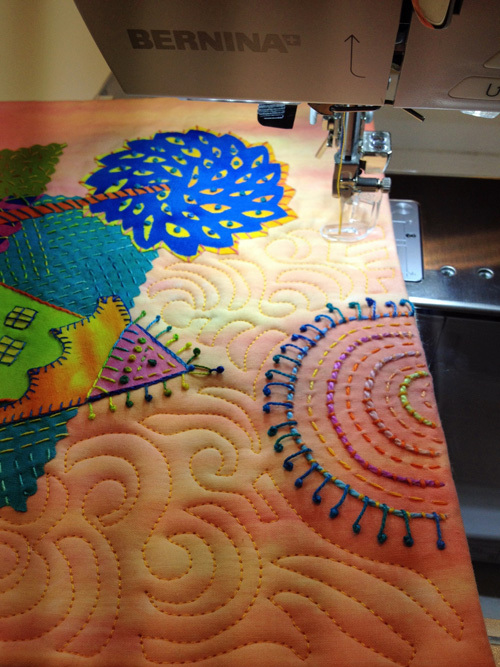 The hand embroidery is complete on my Tilty Town #10 quilt and it’s ready for machine work. Why add machine stitching to this quilt measuring only 10″ x 10″? Because I love the added patterning and texture unique to machine quilting. 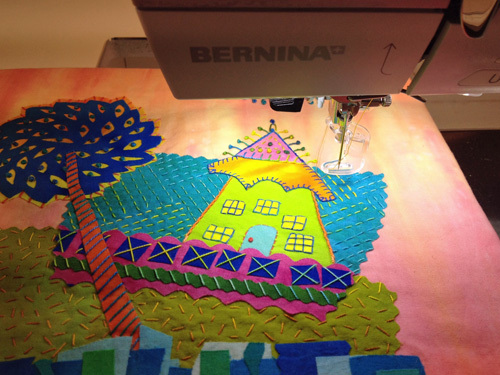 My BERNINA 750 QE, in free-motion mode, easily stitches through all the Tilty Town quilt layers. There is the fused quilt top, wool batting, Timtex, and backing fabric. The freemotion foot is in place, the feed dogs dropped, and I’m ready to go! Machine stitching with a wool batt and Timtex gives the quilt a trapunto look. Areas with stitching are held flat onto the Timtex. Areas without machine stitching puff up. Thanks to the lofty wool batting, there is a definite bas-relief to this quilt. The stitching is what sets quilting aside from other art forms. Sure, it has a functional purpose of holding all the layers together. But stitching has another purpose. Stitching creates a relief and texture on the surface of the art found in no other art form. The stitch makes quilt-making unique in the art world. 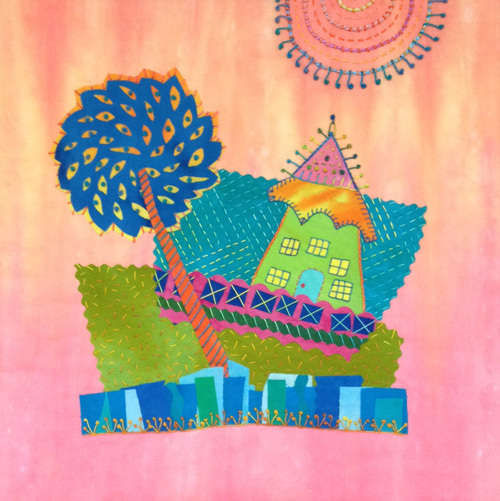 To see more of my art work and learn more about creating fused art quilts, please visit my website, Artfabrik. 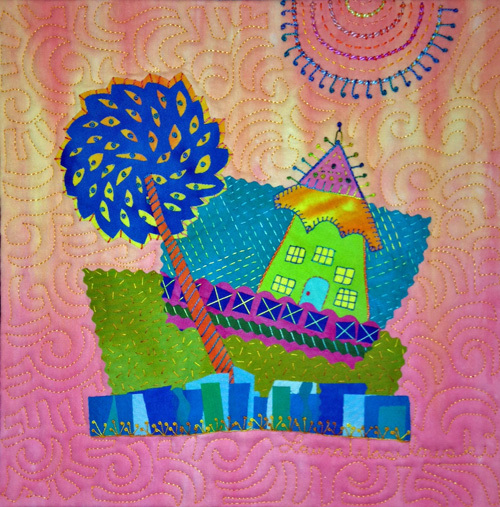 Or check out my class on Craftsy, Hand-Stitched Collage Quilts. Previous Previous post: Chicago Skyline Shadowbox – by Embroidery Machine!